I’ve finished. Disappointed with results, but happy. So, I have finally ‘Finished’ my game. it’s not exactly 100% done, but i had to end it, since I have to get up early in the morning, (It’s currently 2 am here). The first world is basically programmer art, but the second world looks decent. I’m not sure if the player will figure out that you have to change to the skill (with C) then press the X button to use it. And the first skill lets transports you to the beginning of the level of the other world you are on. I was going to have checkpoints, or something but I had no time. I was going to make BOTH worlds big, but had to throw something quick together for the first world. So all in all i guess I have to call my first ludum dare a success, since I got something up! I learnt a lot (I hope) so yes, i did have fun, even though it was pretty stressful. Will I do it again next time? Maybe… Probably yes. This was my entry for Ludum Dare 27. It was made in around 15 hours with most of the work done on Saturday. It is a simple arcade style game inspired by Pac-Man, but it automatically moves onto the next random “maze” every 10 seconds with more enemies added in over time. My primary goal was to simply finish something, even if it’s not too original or amazing of a game. I’ve been participating with Ludum Dares off and on for five years, but I kept biting off more than I could chew and running out of time before nearing a completion. This time I tried to keep everything as simple as possible — a character that lacks complex geometry, has only two bones, simple animation, and minimal texture mapping. Even though I did not have the full 48 hours available to work on it, I succeeded in creating something and I consider that is a pretty big accomplishment considering how little time there was. Because most of Saturday was spent with family before I head off to college, I was pretty much short a day. This extra time certainly could have been used to add more to the game and polish things up a bit. I Jumped straight into development without spending much time brainstorming game ideas. Halfway through making this I came up with a few game concepts that I think could have been more fun, unique, and funny, but I didn’t have the time to scrap what I had and start over. I kept having a weird problem on Kongregate where my game gets moved down a little and cuts off the bottom of it. No matter how I tried to change the size settings nothing seemed to fix it completely, so I just tried to have it cut off as little as I could. Near the end, the project started to get a little hacky and messy. I was experimenting with using a heavily component based style of game design, but I wasn’t entirely certain how to handle some special case problems, since I was trying to keep everything generic with pretty much no specialized gameobject code. I think I now have an idea of how to better handle entity state switching. I with into it with the plan to keep things as simple as possible. There were very few assets and what it had were extremely simple. Probably the number one reason I failed to complete any of my previous Ludum Dare projects had been because of spending too much time making too detailed of graphics, so I managed to avoid making this mistake again. Although though there were times when I had to really push myself to keep going, development went pretty smoothly without any major problems. I finally completed something! I first discovered Ludum Dare five years ago, and this is the first official competition game I actually finished! I also finally have something put up onto a web game site, which is kind of neat even though I don’t expect too much from it. All-in-all it went pretty well and has left me wanting to make more games! It’s called BLAM BLAM PLANET and was done in 3 days. Yay us! Play it, if you dare! Hello everyone! I am here today to share with you a game that was born here, in the Ludum Dare, as a warmup game, and now I completed it as a fully playable game with everything a real game needs; Achievements, story, infinite mode, unlockable weapons, highscores, etcetera, etcetera! The original game, formerly ‘Earth Defenders’ was a crappy minigame I made as a warmup for my first Ludum Dare, under an interesting mechanic: A 360º Space invaders twisted clone. at the moment with my little game design skills and motivation it ended up being fun, but not fun nough, and definately not as pleasant! Enjoy it and dont forget to share it with your friends, thanks everyone! Hey there developers and gamers! I had a lot of fun with Ludum Dare last weekend. It’s always a blast to make a game that turns out pretty good! — Not using a chunk engine. It’s true. The original engine I made had the start of a chunk engine. It didn’t make sense. It was awful! I LOVED streaming, not just because it motivated me, but because I got to meet some really neat people in the chat. I listed everyone I could remember in the “EXTRA” section of my game menu because it was so fun. 48 hours to make a game. It seems impossible, but when you start doing it, it’s surprising how fast you work. At least for me. I was able to get done what I had to get done in the time I had to get done doing it (twitter reference). It’s not really expected to have a detailed game during Ludum Dare, but I feel like the features I did have weren’t pushed to the right spot. The regenerating stamina was too slow, the leveling up was boring, and some other things (like the particle size). I’m sure it would make the game less glitchy if some of my rendering wasn’t messy too. Hopefully I’ll get around to fixing it up and making it a finished game! I haven’t been this proud of myself in a long time! I’m so glad to be sharing this with you! Also, I didn’t manage to get all three pieces of music in the game (because I’m not a proper programmer), but I promise I’ll upload the soundtrack soon, as I’m proud of it too! Thank you thank you thank you, for the fantastic experience, third time in a row! I can’t believe that in the first LD, and the second game I’ve ever written I managed to make it into the top 10 for a category! Not only any category but theme, from the looks of things it is an area that a majority of people work very hard to make a game that fits the theme. I was also please my result of 100th for innovation and for other areas it was what I expected around the 200 mark (there were 400 entries into the jam so they were very average scores) . I’ve had a fantastic time, learning a new language, object orientation and how to quickly generate an achievable if ambitious goal. I am very please with the community and the mature approach to constructive criticism. I’ve had great fun playing, rating and reviewing games (I made sure to comment on each and every rating I made). I’ve learnt a lot, pleased to have actually taken part at last, even more pleased by my results. I’ll see you all in December! This is my first ever LudumDare out of 4 when I managed to finish my game in time. 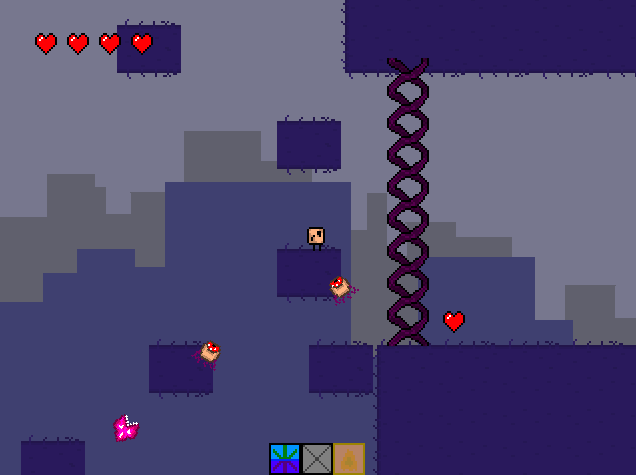 No sounds though but everything is working fine and every feature I wanted in the game is implemented. So I consider this a big success! So what are you waiting for? Go diamond hunting on staticvoidgames.com! Just click ‘Applet’ on the left to play Gems of the Evolving Land in your browser. Here is the entry page please rate! This is the stuff! I feel the urge to experiment, to breathe the true spirit of the Ludum Dare, and push myself into a realm I have never before dealt: the isometric map. Spent the hours I had this morning figuring out how to best render an isometric grid, and now…SUCCESS! Step one complete, I shall move on to some placeholder graphics and start the control scheme. This is my visual reference chart, the visual references that most influenced how the game looks. Ikaruga has a prominent role visually, even though I did play some Jamestown, Touhou 8 and Xenon II to get a feel for things. I used a 21 color palette which grew organically as I added more and more stuff. It’s the strange shape at the bottom left of the timelapse. I also tried to keep with a vertical composition and Korean text, in its (less usual) top to bottom form, was a huge help in establishing the look. Korean and chinese drawings were also a big influence on the style. I always like to have reference for everything before I start to work. In this case there’s background ideas, spaceship designs, photos of insects and stylized korean drawings. I used one main photoshop file to draw new stuff, so that I could see them relative to other assets. Essentially, a mockup/overview of the game. The ship was my first animating challenge for this game. I had chosen an asymmetrical design, so left and right animations would have to be different, and not just a flipped over version. The tentacles. This took 3 hours. Sine wave movement again, but these were harder. The two right tentacles are flipped versions of the two left ones, with a time delay of 3 frames, so that the movement looks more organic. I will now attempt the daring feat of sharing what this experience felt for me, so we can all benefit from it as game designers/developers/artists. It was exhausting and super fun. I particularly enjoyed composing the music, and how we came up with an interesting gameplay mechanic (teleportation). Coming at it as equals and negotiating ideas did a world of good for our game. Our main inspiration was the Touhou series of games for Fedor (I’d only seen gameplay) and Ikaruga for me (finished the game several times). I started doing graphics on Saturday morning. I worked on a mockup photoshop file full groups of layers, to which I returned throughout development. For example, when I needed a new enemy, I would fire up the mockup, draw the enemy next to all the other sprites and then paste it into another photoshop file and animate it separately. I would then export as individual .PNGs (Photoshop’s “Render Animation to Video” was very helpful). Dropbox of course saved our lives, and we communicated through skype’s chat. In fact we haven’t even seen each others’ faces. I used Photoshop CS5 for all animation and graphics, and Fruity Loops with free soundfonts to write and perform the music. Post mortem: We gave it our absolute best. A coding set-back made the scrolling clouds unusable, so Fedor had to wing it at the last moment, which left the background a little bleh in my opinion ( I had no time to make changes to the cloud graphics and scrolling). But even so, when at the last minute he managed to fix the clouds so we at least had some, it was very exciting. The level is very very well thought-out and very fun to play. It took Fedor, what, 6 hours? to come up with the patterns that complement the teleport mechanic. The 3 hours before deadline were, for me, mostly about helping Fedor out with any requests, like changing sprites or giving him a list with all the visual elements he had yet to implement. I made a second enemy ship graphic in 15 minutes, since Fedor made enemies with two different numbers of hit points, and I felt we needed to be able to tell them apart. This was done 2 or 3 hours before deadline, when Fedor was struggling with the stupid clouds. He added the second enemy graphic in the game 1 hour before deadline. I also wanted finite lives implemented (9 of them, as many as the tails of the Kumiho fox-spirit), shown only everytime you are resurrected from a death, in order to keep the interface as clean as Fedor wanted it. Scoring wouldn’t have hurt either. But we didn’t have time to even negotiate it, because the ideas came too late. Even if they had come early, we wouldn’t have had time. I stayed up Sunday 12am to Tuesday 6am, and it’s the longest I’ve ever been awake. So, overall, I couldn’t have wished for anything better, I had the fastest and best coder at my disposal, we had a crazy schedule and working hours, and implemented almost everything we set out to implement, and still had time for a little polish. And with a great success. With 11 finished entries, more than I could hope for. I will pack the games in a package and post a download link around 18.1. The games run on windows, and should also run on linux (some with wine). They mostly make use of python and pygame, so that will probably be a requirement to run the finished bundle. I’ve participated in a few ludumdare contests over the years, one with a friend. This friend gave me a call about me helping out with some flash stuff for JunglePeak. I meet up with them and pushed that I’m very interested in making games. I also took a lower price for game development. I did a few things, mainly flash website stuff, for them and it worked great, well, except for me working more than I want, I wanna work with games and have the time off with my family. So I introduced my current day job with this entertainment company hoping I could consult, that resulted in nothing. A few weeks later Ludumdare 11 took place, one of the highlights of the year, I made Exxon – The oil contaminator a game based upon an idea I’ve pitched for this company. So the Monday after LD11 I sent the game to the entertainment company and a few days later the CEO called me up. He wants me to lead the development for their MMO flash game. Three weeks later the contract is signed and after the summer I’ll start making games for a living, partly thanks to Ludumdare. 22 queries executed in 0.122 seconds.